You are here: Home / Recipes / 27 Tasty Sliders Recipe you need to try! What is it about sliders that just make them so good! They fit perfectly in your hands and taste amazing. These 27 sliders recipes range from french onion to crab sliders and pretty much everything in between. Whether you are making dinner for your family or a crowd these recipes are sure to please! Hello yum! Now I feel like firing up the grill, oven or stove top and whipping up a few sliders for dinner. I need to learn to not work on recipe posts when it is almost time for dinner and I am not sure what to make. I end up wanting to make everything and anything that looks good. Do you have this problem when you look at Pinterest or delicious recipes? What is your favorite sliders recipe? Thanks for including my Carolina Chicken Sliders! All these sliders look amazing. Your welcome! The recipe looks amazing! Happy to see my Green Chile Turkey Sliders made the cut! Thanks! So many of these I want to try now! The Green Chile Turkey Sliders look soo good! I can’t wait to make them. My Dad loves sliders, will definitely be trying some of these recipes. 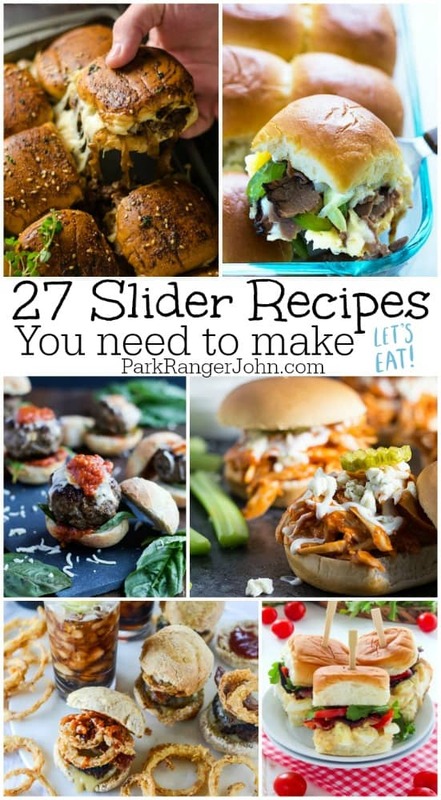 There are some really amazing slider recipes here. I would love to try the crab cake sliders.